Diablo's 6-Piece demolition reciprocating saw blade set brings together two of the brands top selling blades - Demo Demon and Steel Demon. Diablo's reciprocating saw blades are specifically designed for maximum performance in nail-embedded wood and metal cutting/demolition applications. The Diablo Steel Demon Carbide-tipped reciprocating blades are the first carbide-tipped blades designed for extreme metal cutting; including high strength alloys, cast iron, and stainless steel. This high performance carbide-tipped blade delivers unmatched 20 times longer cutting life than standard bi-metal blades in extreme thick metal cutting applications between 3/16 inch. to 1/2 inch..
10-Piece Metal-Cutting Demolition Reciprocating Saw Blade Set Diablo's 6-Piece demolition reciprocating saw blade set brings together two of the brands top selling blades - Demo Demon and Steel Demon. Diablo's reciprocating saw blades are specifically designed for maximum performance in nail-embedded wood and metal cutting/demolition applications. 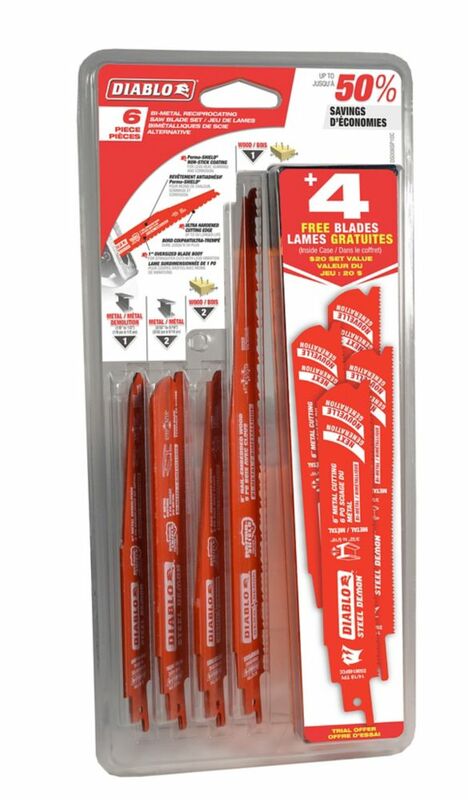 10-Piece Metal-Cutting Demolition Reciprocating Saw Blade Set is rated 4.6 out of 5 by 38. Rated 5 out of 5 by Moose from Wood and nail blade pruned my cratemyrtles well.... Wood and nail blade pruned my cratemyrtles well.